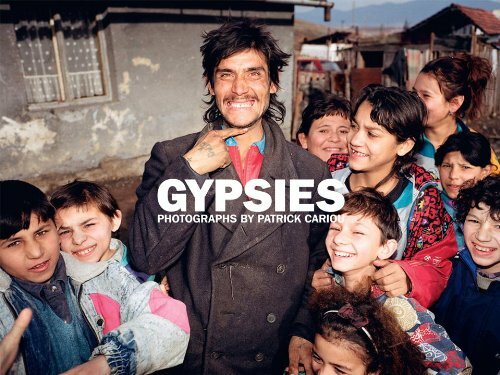 With Gypsies, photographer Patrick Cariou and writer and filmmaker Guy-Laurent Winterstein retrace the migration of the Rom people (the Gypsies’ own term for themselves) from northern to southern Europe, the Middle East, and ultimately to India, the home of their ancestors. The original journey was an epic, thousand-year odyssey and Cariou and Winterstein have labored more than a decade to retrace it. Cariou, a self taught anthropologist and a professional and award-winning documentary, portrait, and fine art photographer harbors a lifelong, passionate fascination with outlaws and renegades and an equal ability to earn their trust and respect. In 1997, Cariou’s first monograph, Surfers featured the thousand-yard stares of renowned and revered athletes who had famously chosen the sea over land, movement over stasis; in 2000 he produced Yes Rasta, after vanishing into the Jamaican forests in pursuit of the last members of the true and hidden cult of Rastafarianism; and now, in 2010, with Gypsies, Cariou comes to the end of his travels spent documenting a sparse landscape of itinerant clans living in a world apart for hundreds of years. Himself a gadje (non-Gypsie), photographer Cariou relied on writer and filmaker Winterstein as his point of access. A Manouche Gypsy born in France, Winterstein’s family connections enabled the expedition to begin, and his fluency in the Gypsy tongue facilitated it as the pair headed east. The result is a stunning and thought-provoking collection of portraits and landscapes that demonstrate the wide variety of conditions in which the Gypsies of the world find themselves, from citizen to gangster, from the flashy prosperity of the Mercedes-driving Manouches of France to the abject poverty of the Kalderash of Slovakia. Incredibly, Cariou’s images reveal the diversity of ethnic types to be found in this global tribe; from the dark-eyed, ringlet haired stereotypical “Gypsy types” in Northern Europe, who seem to display clearly their Indian heritage, to blond, blue-eyed children in Afghanistan, much nearer to the source of origin, who nonetheless have distinctly Caucasian features. These people, scattered far and wide, are a family, bound together by centuries of history and generations of survival.